Here's another fourteen minutes from our show, starting with the ending of "Here to Hear," a catchy little number with slide guitar that we've been playing for a couple months. The third song is "Minor Blast," a tune Jay and Taylor and I have been messing around with since 2006 or so. Its original incarnation was basically Taylor's main bass stomp in C#m, over which I'd noodle endlessly with single-note lines, arpeggios, chord fragments, (occasional) repetition of an interlocking melody - whatever I could find to fill the space - generally ladled with effects. On the Eighth Day, Jay created the "Minor Blast" chorus (first heard in this video at 10:22). With a verse and a chorus, we were on our way. In its present incarnation, "Minor Blast" is an intro (Taylor basses the main riff, Jay backs him from behind the kit, the rest of us try to enhance this core), an opening chorus at a time of Taylor's choosing, solo #1 (Elliot comes in at 10:43), another chorus, solo #2 (yours truly, with phaser and tube screamer, at 11:53), and so on until we close with the final chorus. At 12:19 our friend with the camera drops the lens down for a great in-the-trenches shot that includes a twenty-something guy in the lower left corner who was watching intently every time I teed up. This enthusiasm, this communing with a total stranger, is one of the many things that makes music so worthwhile. After playing guitar for 23 years, I've finally made it to YouTube. Recently we had a big birthday bash for my roommate at our sprawling flat. As part of the party, my band played their first public performance in front of a capacity crowd of 25 who were sardined into our jamspace, a.k.a. James Taylor's bedroom. A friend who was generous enough to bring his camera was shooting from the hallway for this number, "Grayed A." I'm the guitar that's poking out from the right-hand part of the screen. During my solo (1:42 - 2:20), my fretting hand comes into the camera eye, and my black-shirted back, as the cameraman swings to his right to get as much of the action as he can. My volume is higher in this mix because my amp is closest to the camera - and because I'm not timid with the volume knob. Nick (trombone) takes the next solo (2:27 - 3:03), Elliot comes in at 3:11, and Jay dishes a little treat with some balls-out drums (and a game face to match) from 3:38 to the finish. I don't read a lot of self-help articles, but I found this one interesting. 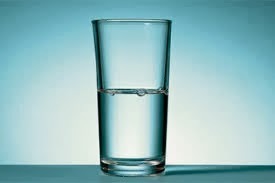 The title ("A Richer Life by Seeing the Glass Half Full") appears self-evident, but some of Jane Brody's points convinced this self-proclaimed skeptic to reconsider his view of what an optimist is. "Unlike Voltaire’s Candide, I’ve yet to be stripped of my optimism, though there are clearly forces in this country and the world that could subdue even the most ardent optimist. "I am a realist, after all, and I do fret over things I may be able to do little or nothing about directly: economic injustice; wars and the repeated failure to learn from history; our gun-crazy society; the overreliance on tests to spur academic achievement; and attempts to strip women of their reproductive rights." "Murphy’s Law — 'Anything that can go wrong will go wrong' — is the antithesis of optimism. In a book called 'Breaking Murphy’s Law,' Suzanne C. Segerstrom, a professor of psychology at the University of Kentucky, explained that optimism is not about being positive so much as it is about being motivated and persistent. Dr. Segerstrom and other researchers have found that rather than giving up and walking away from difficult situations, optimists attack problems head-on. They plan a course of action, getting advice from others and staying focused on solutions." "With the right guidance, many of the attributes of optimism also can be learned by adults, Dr. Segerstrom and other researchers have found. "Both Dr. Segerstrom and the Mayo researchers recommend taking a few minutes at the end of each day to write down three positive things that happened that day, ending the day on an upbeat note." This is sound advice that I first acted on some months back, when I started a gratitude notebook. I miss some days, but the notebook comes out four or five days a week, usually when I'm on the bus, sealed in with my iPod. I don't know that I would call myself an optimist just yet, but I'm working on it.